KIEV, Ukraine -- Ukraine is close to the final stage of eliminating its stockpiles of highly enriched uranium as announced under a landmark agreement with the United States two years ago intended to prevent nuclear terrorism, Ukrainian President Viktor Yanukovych said. In an interview with Yonhap News Agency held on Thursday at his presidential office, Yanukovych also said the second Nuclear Security Summit, a global atomic security conference to be hosted by South Korea next week, should be held on a permanent basis. Ukraine gave an early boost to the first Nuclear Security Summit in Washington in April 2010 by agreeing with the U.S. to get rid of about 90 kilograms of highly enriched uranium by 2012. "The project is nearing a stage of completion," said Yanukovych, ahead of his scheduled visit to Seoul to attend the summit, which will draw representatives from 58 countries and international organizations, including some 48 heads of state, with U.S. President Barack Obama, Chinese President Hu Jintao and U.N. Secretary-General Ban Ki-moon scheduled to attend. Obama hosted the inaugural summit in 2010. Seoul officials said the Netherlands has agreed to host the third summit in 2014, but the likelihood of a fourth summit is remote. "The Nuclear Security Summit should work on a permanent basis by being hosted by each continent," he said. "We cannot simply remain calm until a nuclear security threat occurs. 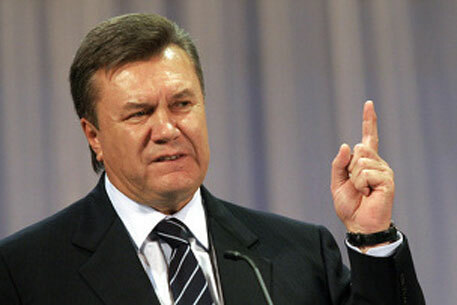 This topic should always be monitored by the public and all the countries of the world," said Yanukovych. The main goal of the Seoul summit is to provide the groundwork to move from commitments made at the Washington gathering to specific actions and to chart a future course for securing all vulnerable nuclear materials to prevent terrorists from accessing them. Ukraine, which once possessed the world's third-largest nuclear weapons arsenal it inherited in the collapse of the Soviet Union, surrendered all of the nuclear weapons in 1996 in return for a security guarantee from the U.S., Russia and Britain as well as economic assistance from the U.S. Asked whether the experience by Ukraine should be seen as a model for dealing with North Korea's nuclear ambitions, Yanukovych took a cautious tone. "The situation currently facing North Korea is completely different from the situation Ukraine faced in the past," he said. With regard to North Korea's nuclear weapons program, Yanukovych said it is very important to start dialogue with the North. The Ukrainian president expects the North's nuclear program to be discussed at the Seoul summit, saying, "all issues regarding nuclear security must be discussed." Next week's summit is not aimed at dealing with North Korea's nuclear ambitions, but the issue can be discussed bilaterally on the sidelines of the summit, Seoul officials said. On Friday, North Korea stirred global concerns by announcing that it plans to launch a satellite next month on the back of a long-range rocket. The North's plan would break a recent deal between Pyongyang and Washington that raised hopes of a resumption of the long-stalled six-party talks, involving the two Koreas, the U.S., China, Japan and Russia, Seoul and Washington officials said. Under the deal, Pyongyang agreed to suspend its uranium enrichment program and nuclear and missile tests in return for massive U.S. food aid. North Korea also agreed to allow U.N. inspectors to monitor a suspension of the nuclear activities.